Here you will find great Limited-Time Offers, Coupons, Vouchers and Deals. Keep checking back here to find great discounts at our Adelaide Adult Shop! 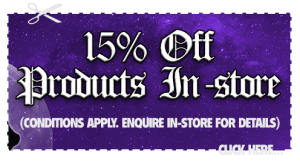 Print-out or Save this voucher to your smartphone handset and present in-store at our Adelaide Adult Shop, and receive 15% off the most expensive item in your purchase (conditions below). Only one discount per voucher. Only Applicable in-store at Kilkenny, Adelaide (Not available with Online Orders including with “Pay In-Store” Orders). 15% off discount applies only to your most expensive item in a multi-item purchase (excluding items detailed below). Voucher only applies to purchases exceeding $50. Voucher terms and conditions are subject to change by Black Knight Erotica at any time without notice. Not Applicable to the follow Brands: “Cowgirl”, “XPOLE” and “AutoBlow“. Some products we are obliged to maintain a MAP (Minimum Advertised Price) policy for.